The Royal Canadian Mint has been running the incredibly popular $20 Silver Coin series since the beginning of 2011, with the Maple Leaf coin the first to be offered. The first six coins in the series have sold out in just a matter of weeks of release – this despite edition limits of 200,000 and over and a limit of three per household. The seventh, the $20 Silver Hockey coin, has been marked as 97% sold-out by the Royal Canadian Mint and so is expected to be completely sold out before long. 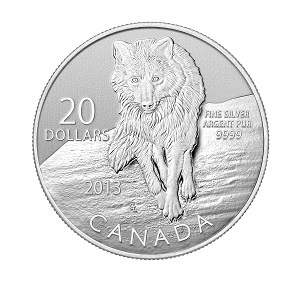 Collectors took notice then when the Royal Canadian Mint recently revealed the eighth coin in this impressive series, the $20 Wolf Silver Coin. The coin features a stunningly detailed reverse design depicting the eponymous predator by Glen Loates, with the obverse showing the traditional Susanna Blunt portrait of the Queen. Again limited to three per household and strictly limited to 250,000 worldwide, as with the previous six coins, this new Wolf issue is set to once more generate massive demand amongst collectors.